In 2011 he worked with the national service program Lasallian Volunteers, through which he taught under-served students at Cristo Rey Kansas City High School. 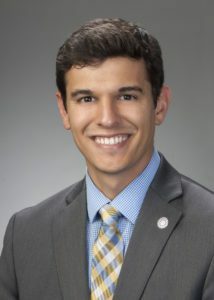 This experience led David back home to Ohio, where in 2013 he helped with the opening of Cristo Rey Columbus High School as the inaugural Chair of the English Department. In addition to teaching for five years in Catholic high schools, David also worked for six years with Cleveland Catholic Charities as an activity coordinator and camp counselor at their SUMFUN summer program for mentally and physically handicapped children. More recently, David worked as a Major Gifts Officer at The Ohio State University’s Fisher College of Business where he helped cultivate philanthropic support of the college from alumni and donors. David Clark is a native of Akron, Ohio where he attended Archbishop Hoban High School. He earned his B.A. in English from Kent State University. As a beneficiary of K-12 Catholic schooling and the son of two teachers, David felt compelled to pursue a life of service in the Catholic faith. David lives in Columbus and attends St. Ladislas Parish.